Twenty-five years ago, Gorbachev took power, the wreck of the Titanic was discovered, and one brave American returned to Vietnam to win the only war America ever lost, armed only with exploding arrows, a huge knife, and a deadly headband. 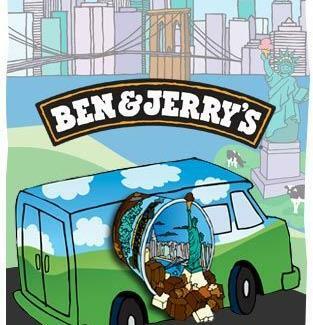 But the most important event of 1985 had to be Ben & Jerry's creation of New York Super Fudge Chunk, commemorating the Vermont legend officially spooning its way into the Big Apple's heart. To honor this urban idol, they're rolling the NYC Scoop Truck into the city for six weeks to give away over 50,000 samples plucked from across the B&J Galaxy, which would've been called "The Milky Way" if that wasn't already trademarked by...science. Truck stops range from U Square to Highline Park to sweet Brooklyn action, but every Wednesday, you actually get to pick the location, by tweeting them and telling them where you'd like them to set up, making your B&J flavor "Office Hero". Or if you're a freelancer, "Nontraditional Workplace Hero". To track down the Scoop Truck's next parking space -- and to tweet in your stop requests -- just hit BenJerry.com. Do it quick, because success goes to the man who draws First Blood. Scream for that Truck at twitter.com/benjerrystruck. Hit them up at Foursquare right here.